Also known as a healthcare power of attorney, this document lets you assign to an agent the right to make healthcare decisions for you, including any types of treatments and which facilities to admit you to. For example, if you need a procedure to improve your blood circulation, and there are some risks involved, your agent would consider the risks and the benefits and then decide whether you will undergo the procedure. This power only goes into effect, however, if you are unconscious or otherwise unable to decide on medical treatments. To specify your wishes regarding end-of-life treatment, you must complete a living will. This document allows you to state whether you want to receive life-sustaining treatments in the future if you become permanently comatose, or otherwise have a terminal condition and you are being kept alive with artificial means. Thus, you can choose not to continue to receive artificial hydration and nutrition, mechanical breathing, and CPR. 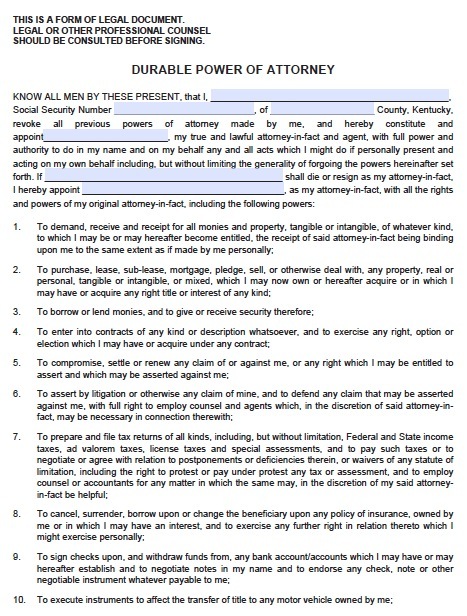 In Kentucky, two witnesses or a notary public must sign this document.